IN THE GLADSTONE DOCK, LIVERPOOL, the sister ships, the Georgic, 27,759 tons gross, and the Britannic, 26,943 tons gross, appear to be identical. Their dimensions are identical but their gross tonnage differs. 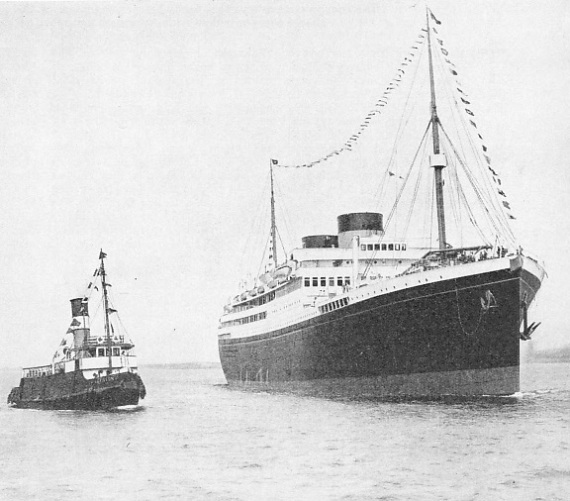 Their appearance differs only in that the Georgic (on the right of this photograph) has a curved streamline bridge front and the Britannic a straight bridge front. Either vessel is 683 ft 7-in long, with a moulded beam of 82 ft 5-in and a moulded depth of 52 ft 10-in. THE departure of a large passenger liner on her maiden voyage is always an important event. 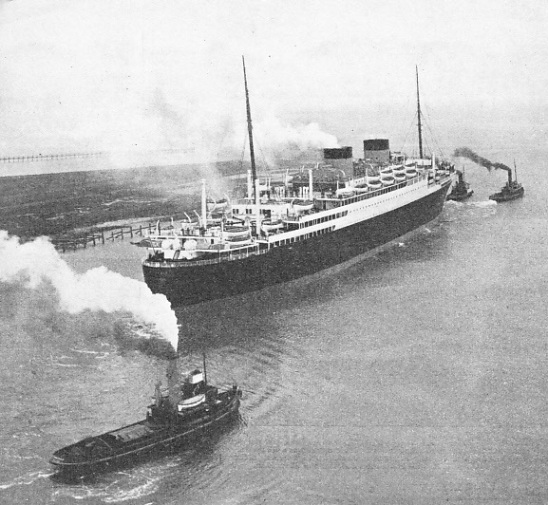 When the Britannic started on her maiden voyage from Liverpool to New York, in June 1930, there was an additional reason for the great interest in her departure. She was not an ordinary transatlantic liner. She was the largest motor-driven vessel and the first British motor-driven passenger liner designed for the Atlantic services. Her builders - Harland and Wolff, Ltd, of Belfast - claimed that a thimbleful of oil would be sufficient to drive one ton of her weight through a mile of water. The Britannic was built at a time when the shipping industry was at a low ebb, and every point of possible economy had to be considered. As she moved away from the Pier Head at Liverpool out into the mighty River Mersey thronged with busy ferryboats and every kind of ship, the Britannic showed the world that her lines were far in advance of those of any other vessel afloat. She was a ship of the twentieth century, with her straight stem and cruiser stern. Her two low, broad funnels emphasized the suggestion in her lines of speed and power. The White Star Line had already built two vessels named the Britannic, the first in 1874 and the second in 1914. If these two famous liners had been in the River Mersey on this day in June 1930 they would have formed a striking comparison with the modern motor liner. The original Britannic was, with a speed of 16 knots, one of the fastest liners on the Atlantic. She had two short funnels and four masts. Her engines indicated 4,971 horse-power and drove a single screw. The engines are fully described on page 721 and illustrated on pages 719 and 720. She served as a troopship during the South African War, 1899 to 1902. After this she was sold to Italian ship-breakers - although, with her original engines and boilers, she was still able to maintain her maximum speed. In 1914 the White Star Line built another Britannic. She was a liner of 48,158 tons gross, the largest vessel in their fleet. She was employed as a hospital ship and was sunk by a mine in the Aegean Sea on November 21, 1916. Her tonnage was more than 16,000 tons greater than the tonnage of the Lusitania, the Cunard liner that had met a similar fate in the Atlantic during the previous year. The new Britannic was not built to rival other liners in size, although she is one of the largest motor vessels in the world. She has a gross tonnage of 26,943. She is 683 ft 7-in in length between perpendiculars and her moulded breadth is nearly 82½ feet. Her moulded depth is 52 ft 10-in. Her sister ship, the Georgic, has a slightly larger gross tonnage (27,759), but her other dimensions are the same. As far as the decoration of the interior is concerned, however, the two ships are totally different. The Georgic is decorated throughout on modern lines while the public rooms of the Britannic conform with various Period styles of decoration. The accommodation provided for the 1,550 cabin, tourist and third class passengers of the Britannic has been spaciously planned. FROM QUEEN’S ISLAND YARD, BELFAST, the Georgic sailed to Liverpool for her maiden voyage to New York in 1932. Her forward funnel is a dummy - as is the Britannic’s - and contains the wireless room. The Georgic attains a maximum speed of about seventeen knots. The cabin-class staterooms are furnished with beds, large wardrobes or chests of drawers, and dressing tables. Some have sitting-rooms and a lobby for wardrobe trunks as well as beautifully tiled private bathrooms. The forward part of the promenade deck is enclosed by glass, and aft is the well-equipped gymnasium. The total distance that a passenger covers when he walks right round the promenade deck is 820 feet. Spaciousness is as much a feature of the public rooms as of the cabins. The dining saloon, decorated in the Louis XIV style, extends in height through two decks. The lounge on the promenade deck is decorated in the late eighteenth century English style. A large central dome is an important feature of this lounge. The Long Gallery leads from the lounge to the smoking-room. This long gallery is tastefully furnished and has proved to be a popular promenade on stormy days. The smoking-room is a remarkable reconstruction of a room from an Elizabethan mansion and is luxuriously furnished. No modern passenger liner would be complete without a spacious games deck and a swimming pool, and the smart tiled pool in the Britannic compares favourably with other swimming pools ashore and afloat. All the tourist and third class public rooms are panelled, with the exception of the children’s playrooms, which are decorated with pictures representing nursery rhymes and fairy tales. Extending the whole length of the ship is a double bottom in which fresh water, water ballast and oil fuel is carried. The Britannic is subdivided by watertight bulkheads into thirteen watertight compartments. She is propelled by two ten-cylinder double-acting four-cycle motor engines of the Burmeister and Wain type, built by Harland and Wolff, Ltd. The cylinders of these engines are cooled by fresh water and the pistons are oil-cooled. The four independent injection air-compressors are each driven by four-cylinder trunk-type motors, and they supply air to four reservoirs for use in manoeuvring. All the auxiliary machinery is electrically-driven. The current is supplied by four diesel-driven generators with a combined capacity of 2,000 kilowatts. These generators, placed in a separate compartment adjacent to the main engine-room, are driven by six-cylinder motors of the type that drives the air-compressors. An emergency 75 kilowatts generator, also diesel-driven, supplies power and light for all the essential services in the ship if the main generators should fail. All the cooking in the Britannic is done by means of electricity. 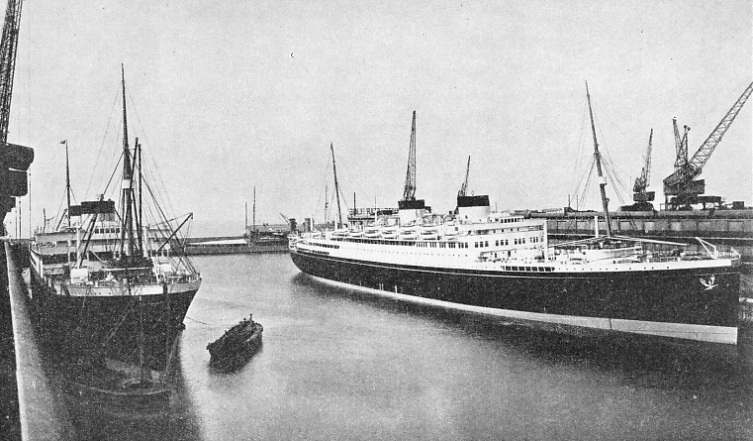 When the Britannic sailed on her maiden voyage in 1930, her sister ship was on the stocks at Harland and Wolff’s Queen’s Island Yard, Belfast. The keel of the Georgic was laid down on November 30, 1929, and in the following November she was launched. Two years after the Britannic, she sailed on her maiden voyage from Liverpool to New York on June25, 1932. Similar to the Britannic in her modern appearance, the Georgic has two squat oval funnels and two slightly-raked masts. She differs from the Britannic in that her bridge has a curved streamline front. The Georgic is propelled by engines identical with those in her sister ship. The great saving of space occupied by the motor engines, as in the Britannic, allowed more space to be allotted to the public rooms and passenger accommodation. The Georgic carries a total of 1,632 passengers in three classes, cabin, tourist and third. In this vessel a spacious palm court has been provided for cabin class passengers. Here tea dances and other special events are held. The staterooms in all classes have hot and cold running water, and in some of the bathrooms hot and cold showers are also provided. Ventilation is afforded throughout the ship by eighty-seven electric pressure fans that vary in diameter from ten inches to five feet. Altogether there are four miles of ventilating trunking in the Georgic and the fans draw the fresh sea air into all the public rooms and cabins. The flow of cool air may be regulated or stopped at will in any room. A close examination of the Georgic’s funnels will show that the forward funnel is a dummy. Portholes will be seen in the funnel casing and these give light to the wireless cabin that is situated inside. The illustration on page 136 shows how the screened fixed-loop aerial for the direction-finder rises above the top of the enormous funnel. The forward dummy funnel of the Britannic is similarly equipped. There are nine complete decks in the Georgic, with eight cargo holds for dry and refrigerated cargo. The refrigeration installation is on the carbon dioxide and brine system and is used for the preserving of fruit, fish, meat and other perishable goods. The deck machinery for the handling of cargo is remarkably efficient. There are eighteen silent electric winches, and twenty winches for handling the lifeboats. Sixteen electric winches are situated at the hatchways with derricks capable of lifting ten tons. Among the rest of the modern deck machinery are four large capstans and two windlasses. The use of electricity in these two ships, the Georgic and the Britannic, is typical of modern ship-design. In the Georgic alone there are 200 miles of electric wiring which carries a current sufficient to supply a town with a population of 30,000. In all there are 200 electric motors varying in capacity from one to 170 horse-power. An interesting feature in the Georgic is the call-system in the passengers’ quarters. When a passenger needs attention from a steward or stewardess, he presses a button in his state-room. This does not ring a bell, but lights up an indicator which shows a red light for a steward and a green light for a stewardess. This is only one of the minor points that have been designed to improve the comfort of the passengers in these remarkable vessels. In either ship great trouble has been taken to prevent passengers being disturbed or inconvenienced by noise. Sound-deadening insulation has been fitted on the outside of the casings and under the decks surrounding the engine-rooms to prevent unnecessary noise from reaching other parts of the ship. The two ten-cylinder diesels of the Georgic have a brake horse-power of 20,000 and drive twin screws giving her a speed of between seventeen and eighteen knots. In the Atlantic crossing the engines use up forty tons of oil fuel in twenty-four hours. The speed of these two vessels, although they are among the fastest motor vessels in the world, does not compare with the fast speeds of the first-class-passenger liners that ply between Europe and America. The Georgic and the Britannic are designed definitely for a special type of passenger, the cabin and tourist classes. Unlike rich business men - to whom a few extra hours on board may mean a loss of valuable time - their passengers prefer to enjoy the comforts of the luxurious liners at leisure. T here is no doubt that the accommodation for cabin-class passengers on these sister ships is scarcely rivalled elsewhere. There are electric lifts, de-luxe suites, children’s playrooms, gymnasiums and all the comforts of the faster transatlantic liners. In addition, regular passengers appreciate the great difference between the decorative schemes of the two liners. APPROACHING LIVERPOOL LANDING-STAGE on the occasion of her maiden voyage, the Britannic and accompanying craft were gaily decorated. This was in June 1930, and two years later this example was followed by the Georgic. The Britannic’s fine stem, the sweep of her lines and her straight bridge front are well illustrated by this photograph. This difference is nowhere better illustrated than in the cabin-class smoking-rooms of the two vessels. In contrast to the Tudor style design of the Britannic’s smoking-room, the same room in the Georgic is modern in style. A praiseworthy attempt has been made to break away from the usual practice of making a liner’s public rooms as similar as possible to a room in a hotel. The smoking-room in the Georgic is panelled with horizontal sections of lacquer work in bright colours, black and vermilion. The effect is striking, for it most appropriately suggests the lines of a steel-built ship. The design of liners has made tremendous strides in the twentieth century, and the new Georgic is a completely different vessel in lines, in size and in type of propulsion from the White Star Line’s first Georgic, 10,077 tons gross, built in 1895. The Georgic and the Britannic run regularly on the Cunard White Star services from London, Havre and Southampton to New York in summer and from Liverpool to New York in winter. On the return voyage they usually call at Cobh (Queenstown), Ireland, or Plymouth, Devon. These two giant motor ships, the Georgic and the Britannic, represent the dawn of a new era in passenger liner design. The use of diesel engines has increased rapidly since these vessels were built. Both ships will be remembered for the elegance of their lines.